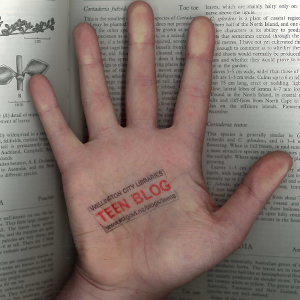 We’ve enhanced our personal brand at the Teen Blog this week by getting a fancy new stamp made, there it is, just up a bit. Nice isn’t it? Expect to see it upon official looking pieces of paper at teen events, various flyers and other things deemed stampable. Like my hand. Basically wonderful. Took me awhile to get into. But the musical talent has improved and they are now more then just a catchy CD. (Although it is VERY catchy) Hayley’s voice as intense as ever. The addition of Taylor was awesome with better guitar and drum beats. Looking forward to the concert. It was a very close run thing between the Glee kids and Lady Gaga, but in the end The Fame Monster came out on top. Go to our bebo page to hear tracks from the top five. Thanks again to the voters, in particular Jess for her review, and congratulations to Lady Gaga for topping a list as prestigious as this one. See you next year! I realise that this book is in our children’s collection, but it has such broadly layered appeal that it would be just as happy on the YA, or even adults, fiction shelves. Author Josh Lieb is an executive producer on the Daily Show with Jon Stewart and the book sticks to that same kind of low brow humour for the switched on intellect that make the show such compulsive viewing. Highly recommended, unless you’re both lazy and patient and want to wait for the upcoming movie instead. Rihanna has really stepped up with sass, aggression and belligerence on her latest, Rated R, and this makes sense given recent headlines about her personal life. A cathartic release that Rihanna can be well proud of, but with such strong material, the real winner is the listener. Will it be a late contender for Teen Blog album of the year? The reason for much of Rihanna’s very public turmoil is Chris Brown, who also has a new album out, Graffiti. This fares far worse – musically and lyrically – and it’s hard to feel any of the sympathy Brown so obviously and clumsily courts on the record. Cobra Starship got their start by recording the title track to Snakes On A Plane, they then turned the subsequent success into While the city sleeps, we rule the streets. If you enjoyed Hot Mess, their 2009 effort, you’ll want to pick it up. More witty, hip dance-punk. Every single person who’s submitted reviews or votes for the best music of 2009 post has mentioned Lady Gaga, usually suffixed with “of course”. Need I say any more? Well, yes actually, as that would be a very short and lazy review. Although with that last sentence padding things out a bit and this one too, I could get away with just saying that The Fame Monster is here and that you’ll likely need to reserve it. Fall Out Boy have now released five studio albums, one live album, and three eps over their eight year career. Sounds like it’s time for a greatest hits album to me, and look at this, Believers never die is just that. A gold star goes to the person who can name the fictional character who played the fictional fictional character in the never completed fictional fictional movie that appeared in an episode of a fictional TV show that Fall Out Boy named themselves after. If that makes any sense. Disney Channel actor and now pop star, Selena Gomez, originally broke into the entertainment business by appearing in Barney & Friends. Kinda like Britney Spears, Christina Aguilera and Justin Timberlake starting off in The Mickey Mouse Club huh? Anyway, she now fronts Selena Gomez & The Scene who debuted with Kiss & Tell earlier this year. Finally some Pop Idol alumni have CDs appearing in the catalogue, American runner up Adam Lambert with For Your Entertainment and Australian winner Stan Walker with Introducing Stan Walker. Having grown up with the original series on TV but not really a Trekkie, I wondered if I would like this new movie. The answer is a resounding Yes! It is great. Lots of action, romance, aliens and the never to be forgotten 3rd man on the mission who never comes back (what was his name again?). “Zadia Bloodstone stood over her victim. Tall, lithe, beautiful and ready to kill! A magnificent vampire, fighting evil in the world. And my creation, my alter ego if you will. Hi, my name is Nina and I am nothing like the Zadia I write about in my books, except that I too am a vampire. A sick looking, skinny being, who got infected back in 1973 after drinking too much at a party and wandering off on my own to puke, only to be found by Casimir, an ancient European vampire. I still live with my mum and the only time I get to go out is every Tuesday night when Father Ramon picks me up and takes me to a meeting of the Reformed Vampire Support Group. We live on guinea pig blood, take supplements and totally zonk out between dawn and dusk every day – not the glamorous life you thought huh! But one of our group is missing, so maybe I will have to use some of my Zadia-side afterall, find the answer and save the rest of us from foul play!” If you like vampires, badies and werewolves this is a fun read with a twist. The first sentence of Ghost Medicine reads I can see myself lying in the dirt, on my back, on a warm, starry night, with my feet up on those rocks, ringing a swirling and noisy fire, listening, laughing, seeing the sparks that corkscrew, spinning above me into the black like dying stars, fading, disappearing, becoming something else; my hat back on my head so I can just see my friends from the corners of my eyes, which says a lot about the book (so I don’t have to, but might anyway). This is quite different from a lot of other Young Adult literature: the writing is intense, poetic, slooow, at times brutal, and nearly always completely excellent. The story is simple; an idyllic summer (hard work on the farm, horse riding, nights outside by the fire, good friends, rather a lot of tobacco chewing) turns tumultuous and dangerous after a series of encounters with the local bully boy (who is unfortunately also the sherif’s son). The characters are a well drawn, the detail is great (especially the horsey stuff), and their predicaments are believable. Read this book if you like things slow and chilled out, but don’t if you don’t. Front and Center, Catherine Gilbert Murdock & Perfect Fifths, Megan McCafferty – because they were DJ and Jessica Darling’s last hurrahs. Shiver, Maggie Stiefvater – because it was so darn sweet. Catching Fire, Suzanne Collins – because it was much better than I thought it was going to be, and I really want to read the last in the series now. Fragile Eternity, Melissa Marr – although I actually thought Ink Exchange was better (but that was last year). You can read the prologue for Radiant Shadows (another bad title!) here. Solace of the Road, Siobhan Dowd – a classic road trip story, where Holly/Solace starts out in search of one thing and finds something else entirely better. I think this is the last of Siobhan Dowd’s books to be published, which is sad. What They Always Tell Us, Martin Wilson – a well-written, down-beat story of two brothers working through very different stuff. Fire, Kristin Cashore – this was good, although I didn’t think it deserved its rave reviews. Nice to see Leck a bit more (the prologue is creepy! ), but I thought that someone who could control people’s minds should have been a bit more dangerous. The Bride’s Farewell, Meg Rosoff – because while it’s no How I Live Now, Meg Rosoff is still a brilliant writer of stories about girls who know how to look after themselves in harsh circumstances. And that makes 10, so that’s like my Top 10 Books of 2009. From Somalia With Love by Na’ima B Roberts. This is a lovely story about a young Somalian refugee girl who lives in East London with her Mum and brothers and extended family. It is about her adapting to the Western lifestyle and trying to keep her Muslim identity. Things change for them all when her father is found and is coming to London to be with them. There is conflict between the two cultures. It is a story about being a teenager with two different cultures and trying to find out who you are. It is also about growing up. A good story for the cultural story part of NCEA writing logs. Jumping off Swings, Jo Knowles (230 pages) – a novel from four perspectives about teenagers having to grow up really fast: Ellie, who gets pregnant; Caleb, who loves Ellie but didn’t, you know; Corinne, who is Ellie’s best friend; and Josh who, you know. A gritty real life drama. First sentence: I can still feel a trace of his warm lips against mine as he slips away from me and fumbles for the door to his father’s van. First sentence: Being dead was colder than Mark had expected. The White Horse Trick, Kate Thompson (342 pages) – These fairies are Irish, which is what all good fairies are. Devastating climate change has hit Ireland, and the ramifications of this are felt in Tír na n’Og (the land of eternal youth, Ireland’s alter ego I think). JJ, an old man, is sent from their back to Ireland to sort out the problem, which is difficult since technically he’s dead in Ireland (being a fairy he’s older than is humanly possible) and must use the “dangerous white horse trick” to make his journey possible. This sounds intriguing. First sentence: They came in the dead of night when the family was sleeping. First sentence: Red, for blood. No Way to Go, Bernard Ashley (287 pages) – Amber’s brother falls to his death from the roof of an apartment building, but Amber is certain this is not an accident; she is determined to find out the truth. First sentence: Amber Long stared into the policeman’s face.